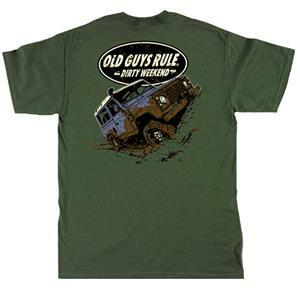 This shirt features a large image on the backof a famous British 4WD and the legend "Old Guys Rule - Dirty weekend", alng with a few mud splashes. There is a small version of the same on the left chest. This is printed on a high quality, pre-shrunk, 100% cotton t-shirt made by Gildan in the colour military green.